At the end of a long, cold winter many of us are eagerly waiting for the first signs of spring. When the last of the snow melts away, the earliest wildflowers begin to appear in March and April. 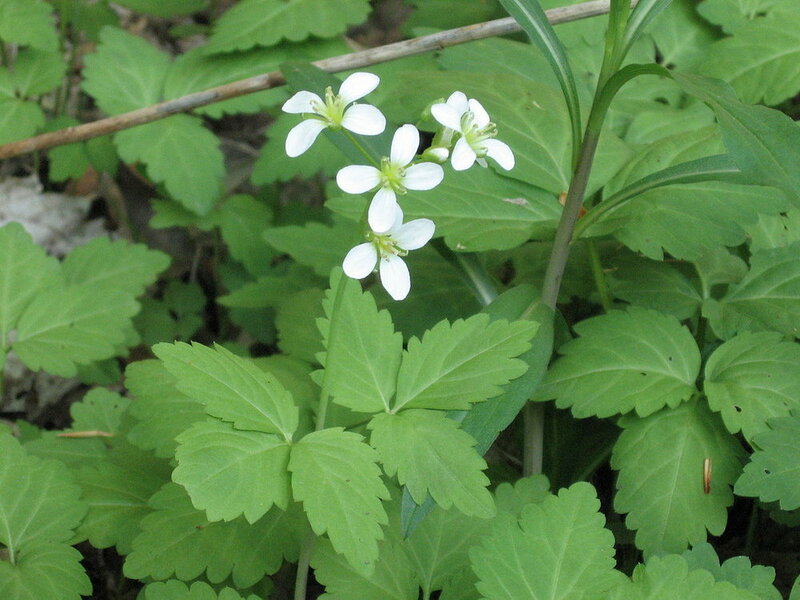 The earliest group of wildflowers to emerge in our forests are referred to as spring ephemerals. Ephemeral means “lasting for a very short time.” Before the trees leaf out, an abundance of sunlight is able to reach the forest floor, warming the soil and encouraging the first wildflowers to push through the leaf litter. These plants emerge, bloom, set seed, then die back and enter dormancy before the canopy leafs out and blocks the sunlight. Frequent walks in the woods are necessary if you hope to catch a glimpse of these fleeting displays of spring. Resist the urge to pick the alluring flowers; they are often sensitive to disturbance and some have laws protecting them. Below is a list of some of our most common spring ephemeral wildflowers. Keep an eye out for them this spring; tread lightly, take only photos and leave only footprints. Emerging from an underground reddish rhizome, bloodroot typically grows less than a foot tall, the single large basal leaf clasping the flower stem. Commonly found in moist to dry woods and thickets, on flood plains, and near shores or streams. This wildflower blooms in early April, before the foliage unfolds. A single, white flower with 8-12 delicate petals, yellow stamens, and two sepals. The flowers produce pollen but no nectar. Colonies are formed through underground spreading rhizomes containing reddish-orange toxic sap, the reason for the common name. 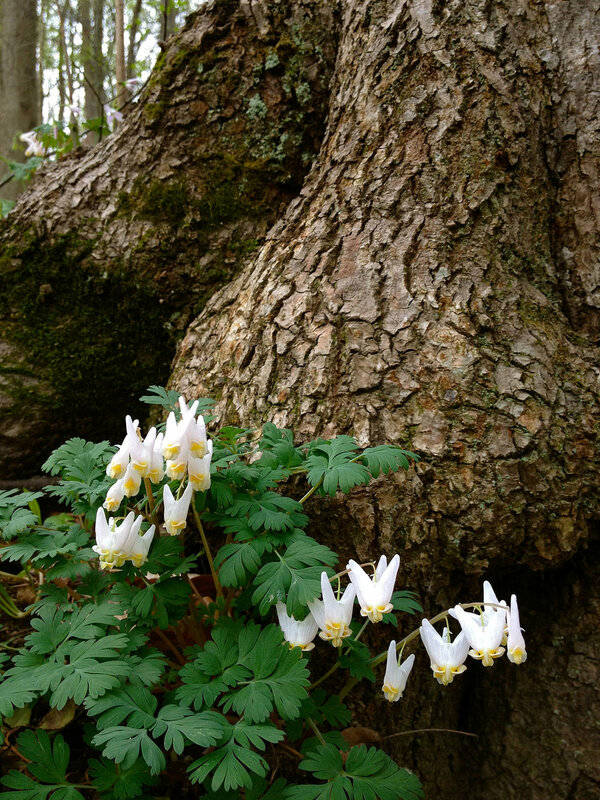 Bloodroot produces toxic alkaloids, primarily sanguinarine, which are stored in the rhizome. Sanguinarine kills animal cells. Contact with skin may destroy tissue and result in a scab. Ingestion can lead to vomiting and loss of consciousness. Small bees and flies act as pollinators. Native Americans used bloodroot as a medicine and as a dye for fabric. As the name implies, the plant’s growth form is based in threes. 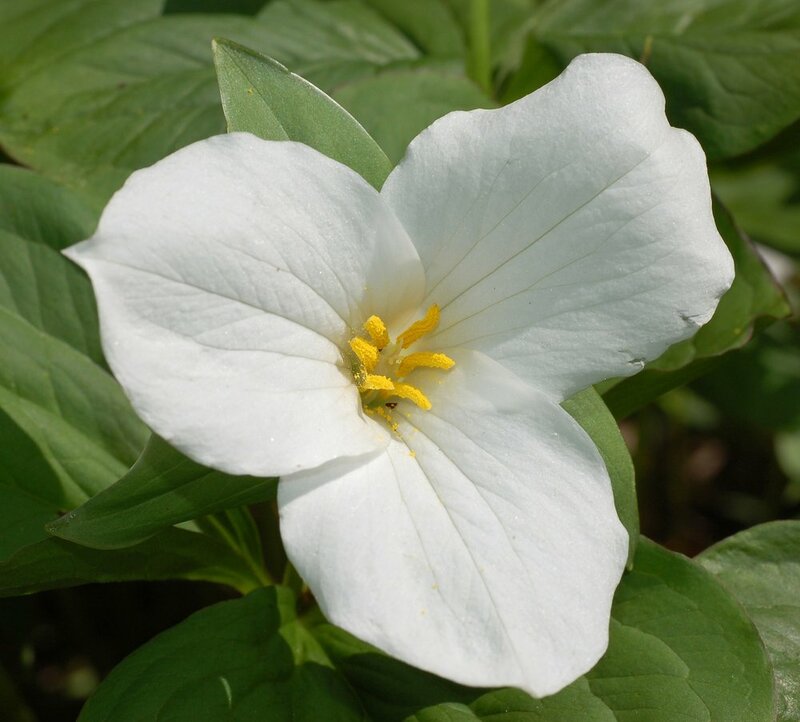 Trilliums have three leaf-like bracts whorled around a stem, producing a single flower with three sepals, three petals, and six stamens in the center with three stigmas. There are 39 varieties of native trilliums in the United States. 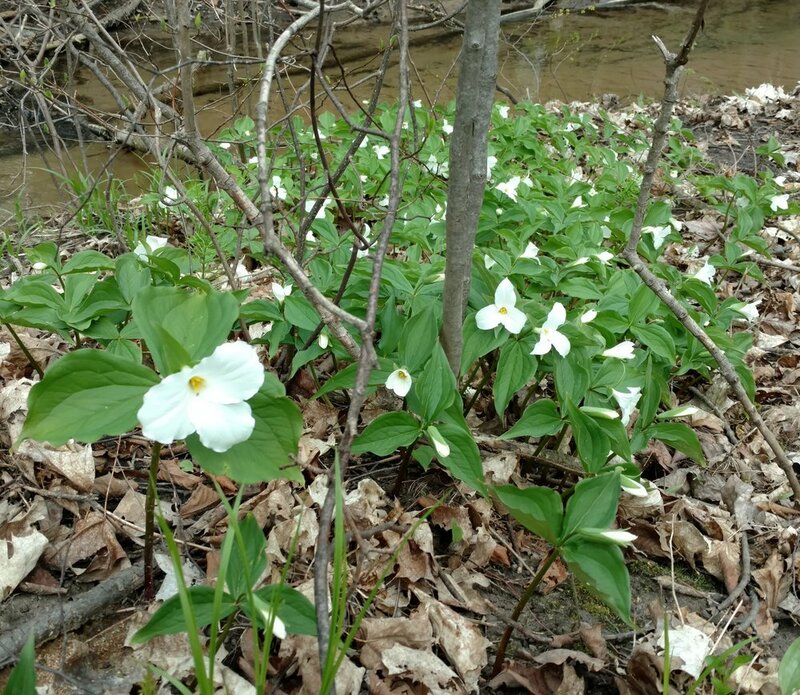 The most common trillium in Michigan is the eastern white trillium, occurring in every county. Large, white, odorless flowers grow pinker as they age. Honey bees, bumblebees and wasps act as pollinators. Trillium are a long lived (25 years) yet very delicate plant and can be killed unintentionally by picking the flowers. Some species of trillium are listed as threatened or endangered and collecting these species is illegal in Michigan. High deer population density decreases or eliminates trillium in an area. The pinkish late flowers are sometimes confused with the related red trillium (Trillium erectum) which is rare and displays deep red flowers that have no nectar and exude an odor of rotting meat to attract flies and beetles as pollinators. Other common names include yellow dogtooth violet and Adder's tongue. The name “trout lily” refers to the appearance of its green leaves mottled with brown or gray, resembling brook trout. Often only the leaves will be present as the trout lily does not flower for the first 4-7 years of its life. Young plants will only grow one leaf until it has reached maturity and will then grow two leaves with a single yellow, stalked, nodding flower. 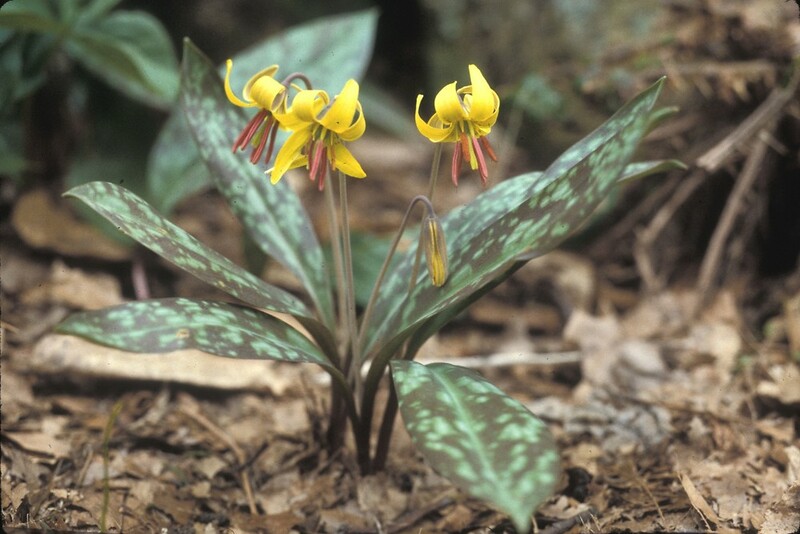 Trout lilies grow in colonies that may be up to 300 years old. White trout lily (Erythronium albidum) occurs in the southern lower peninsula and along the Ontonagon River. Look for this peculiar plant in wetlands when snow is still prevalent. A thermogenic plant, skunk cabbage is able to produce its own heat through cellular respiration. The plant can be found poking through circles of melted snow. Flowers emerge in very early spring, a 4-6” mottled purple spathe with a spadix inside. Large green leaves emerge later. When bruised, the plant exudes a strong fetid odor resembling decaying flesh to lure insects for pollination. Native Americans used skunk cabbage as a medicinal plant, seasoning, and magical talisman. The roots and leaves are toxic raw, but the leaves may be dried and used in soups and stews. This small, low-growing wildflower rarely reaches 1 foot in height and produces a single pair of slender leaves. The pale pink flowers are accentuated by darker pink veins consisting of five petals and have a pleasant floral fragrance. Blooming lasts a mere three days and the anther is only active for one day. Spring beauties are noted for their abundance in forests, lawns, parks, roadsides, and wetlands. The Iroquois would give a cold infusion of the powdered roots to children suffering from convulsions. Many Native Americans cooked the root like a potato. The entire plant is considered safe for human consumption and is rich in nutrients like potassium, calcium and vitamins A and C.
A member of the carrot family, this wildflower reaches 6” tall on average and produces flowers with white petals and large, dark-reddish anthers. The five teardrop petals are widely spaced, not touching each other. Another common name is pepper-and-salt plant, referring to the black anthers and the bright white petals. 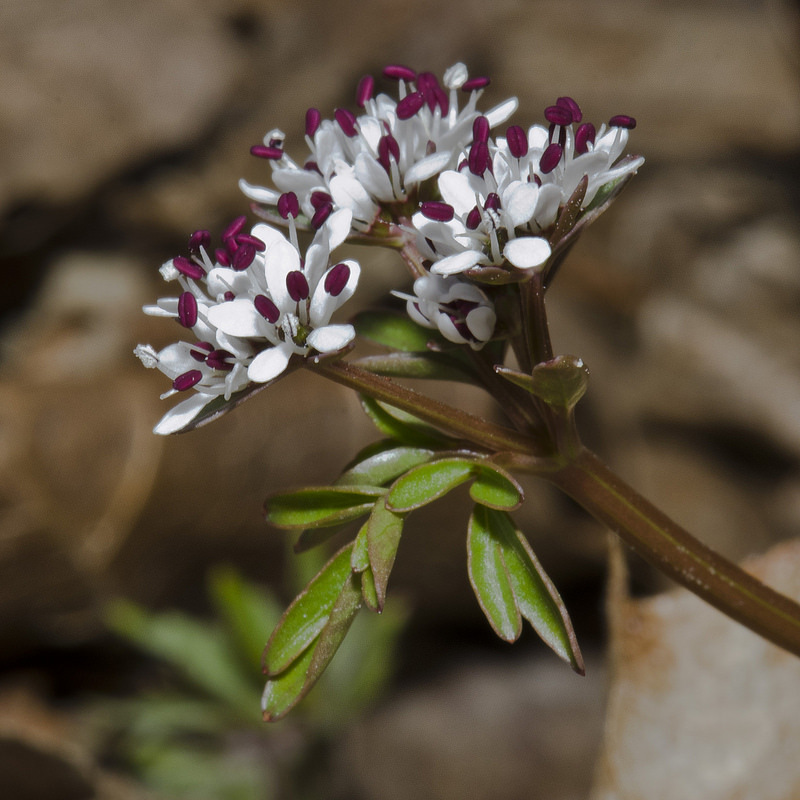 This wildflower is one of the earliest to emerge in rich hardwood forests in spring. Pollination is performed by solitary bees, flies, and honey bees. The Cherokee were known to chew this plant to treat toothaches, and the bulb may be eaten cooked or raw. The two species of toothwort in Michigan are two-leaved toothwort (C. diphylla) and cutleaf toothwort (C. concatenata). 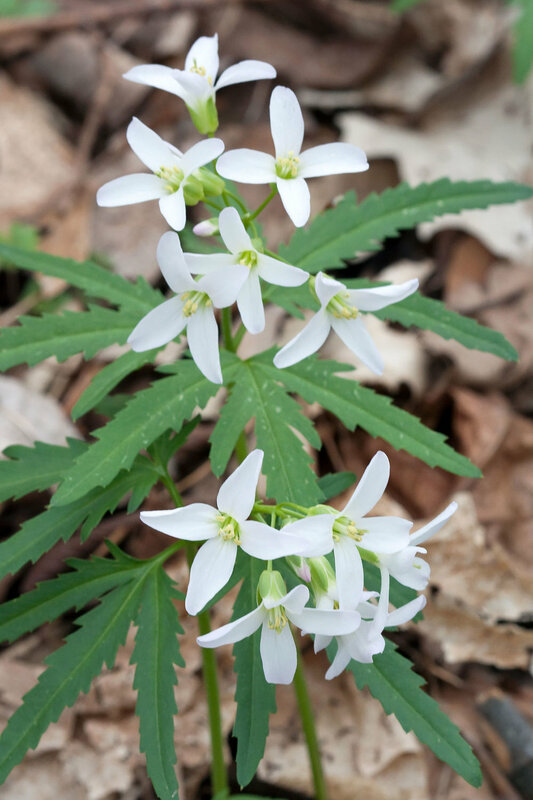 Two-leaved toothwort has large, broad leaves and occupies moist cedar swamps while cutleaf toothwort has slender leaves and prefers rich beech-maple forests. A smooth, unbranched plant up to 1 foot tall, both species display white to pinkish flowers and have four petals held above the foliage in a spike. Emerging foliage may be purple initially, turning green in time. 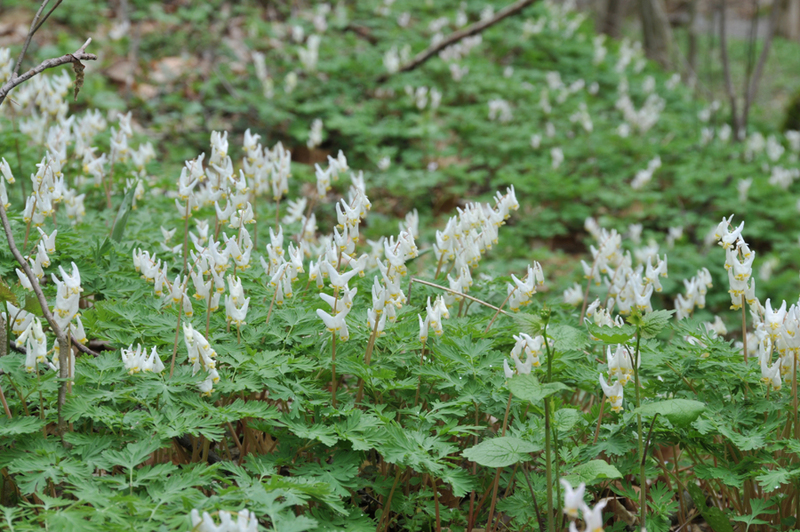 Toothwort is a host plant for the West Virginia white butterfly; however, the invasive species garlic mustard is threatening the survival of the butterfly. The butterfly confuses the similar looking flowers; if they lay their eggs on the invasive plant the offspring will die. Native Americans used the plant for a vinegar-based relish and medicinally to treat many illnesses. Other common names include: windflower, thimbleweed, and smell fox, an allusion to the musky smell of the leaves. The foliage reaches an average height of 6” with flowers held above on short stems. The solitary flowers are usually white, but may be pink, lilac or blue. Hoverflies are a primary pollinator. In woodland conditions they can carpet large areas quickly as the rhizomes spread just below the soil surface. 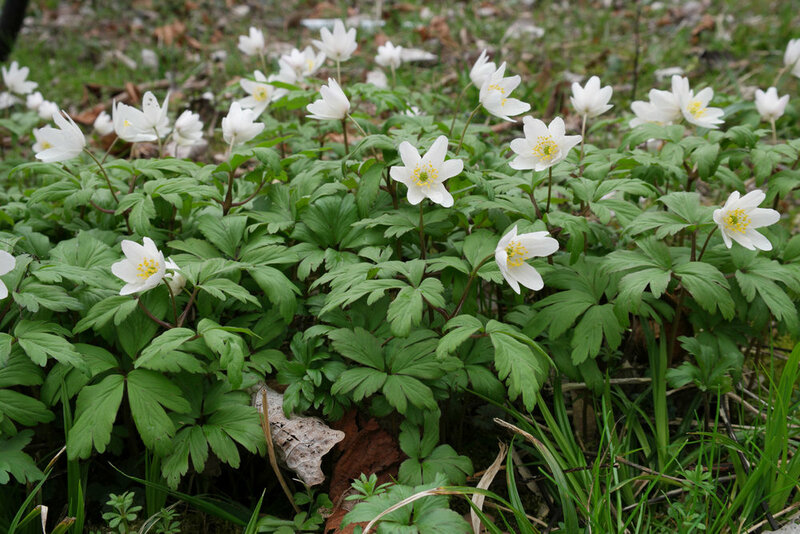 The slender stems allow the plant to tremble in the wind, earning the common name windflower. 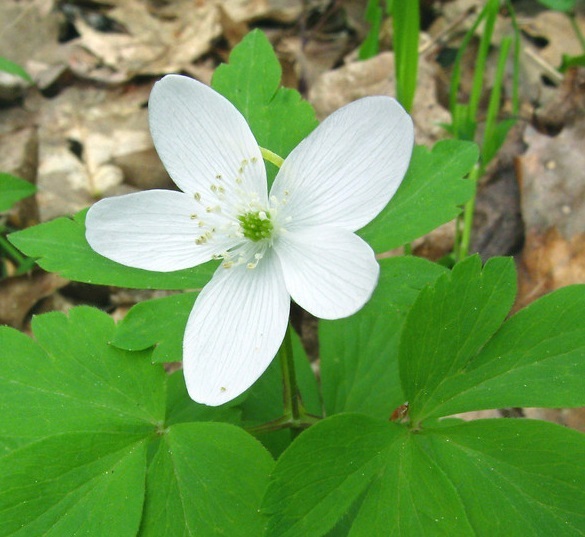 Although Native Americans utilized the plant as medicine, wood anemone is considered toxic to animals and humans, causing severe skin and gastrointestinal irritation. Out of a mass of fern-like leaves emerge stalks of 3 to 14 white or pinkish unscented flowers. The flowers resemble a pair of breeches hanging upside down, hence the common name Dutchman’s Breeches. The unique flower shape is adapted for pollination by bumblebees as they are able to separate the outer and inner petals of the flower to access the pollen. The flowers wilt almost immediately upon picking, so they should not be picked in the wild. Native Americans utilized the plant as a medicine to treat syphilis, skin conditions, and as a blood purifier. However, this plant may be toxic and causes dermatitis in some people. 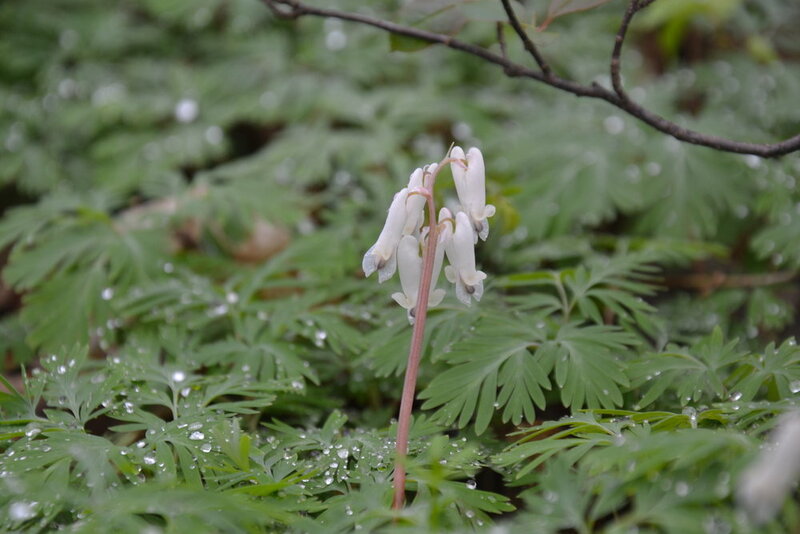 A similar and closely related wildflower, Squirrel Corn (Dicentra canadensis) has fragrant, heart-shaped flowers. Many of our spring flowering plants have evolved mutualistically with ants in an interesting seed dispersal relationship called myrmecochory. Seeds of these plants have an extra appendage on their seed called an elaiosome. The ants transport the elaiosomes, which are rich in lipids and proteins, to their dens and dispose of the seeds in underground nest waste disposal areas, the optimal environment for germination and protection from seed predation. 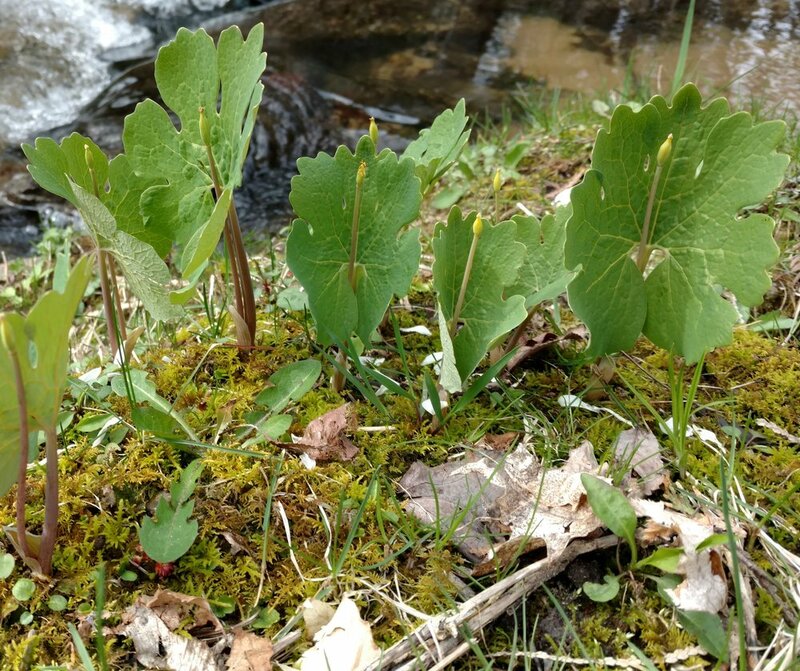 Bloodroot, trillium, trout lily, spring beauty, dutchman’s breeches, and squirrel corn all utilize this fascinating adaptation.